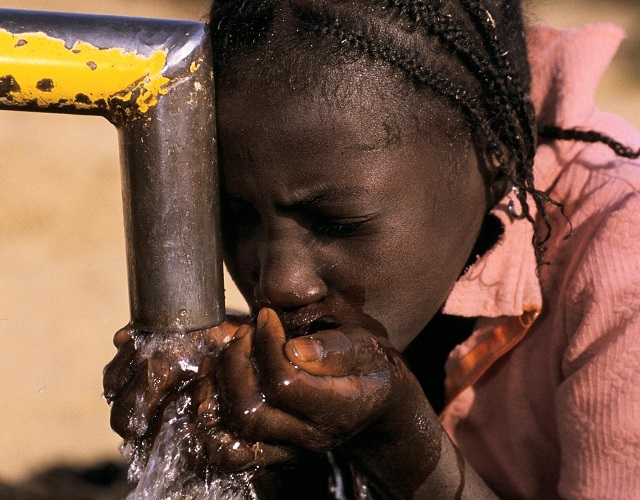 In 2015, the United Nations and World Health Organization (WHO) estimated that there are 663 million people around the world without access to safe drinking water, with nearly half of these people living in sub-Saharan Africa. 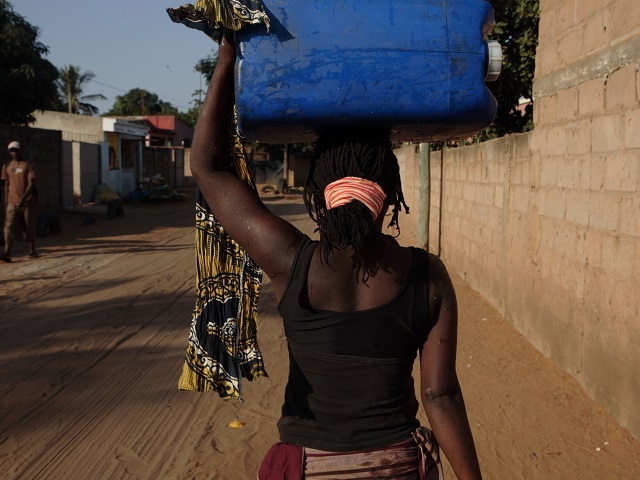 While Africa’s urban areas had a slightly higher rate of access to piped water than rural areas, this access decreased from 43 percent in 1990 to 33 percent in 2015. Seeing as Africa’s urban population doubled from 2000 to 2015, access to water remains a critical issue in the region, growing even more urgent. Solving the problem of access to water for 600-700 million is easy, right? Just give it to them, no? Sadly, this is not the case. Promising water projects can fail for a whole host of reasons—financial, economic, social, institutional, technological or hydrological. Pumps break, wells run dry, get polluted, projects don’t get finished…things fall apart. Unfortunately, there is no shortage of failure in the water, sanitation and hygiene (WASH) sector. Anyone who has worked in the sector, myself included, can list an instance where a project failed for some reason or another. The Playpump story is well-known. Others, such as this IIED studied example, are not. My doctoral research in Dar es Salaam, Tanzania documented a national infrastructure scandal that forced the resignation of the prime minister, unnecessary cholera outbreaks and institutional dysfunction in the water sector in the wake of a failed private sector participation effort. In my view, failure—and potential success—will always be a factor of economics and governance. Economics is relevant because not only does infrastructure take funds to build, but water services also cost money to maintain. Governance is relevant because decisions about where services are built and maintained are often a factor of political, economic and administrative choice. If one takes a step back and thinks about what access to water is, whether one is getting water from the private or public sector, one often pays taxes and/or per unit purchase costs. An excellent exposition of this sort of service delivery model is the 2004 World Bank World Development Report – “Making Services Work for the Poor”. As seen in Figure 1, this simple model of WASH governance shows the “short route” accountability that is associated with purchasing water or sanitation services from the private sector. 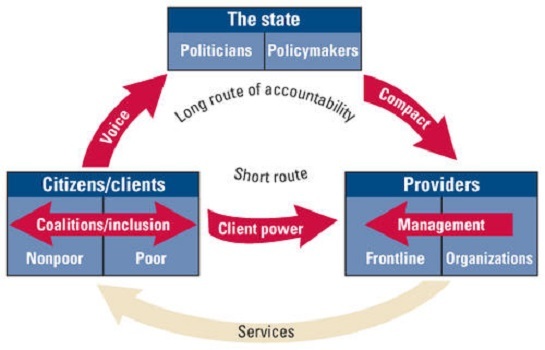 The “long route” of accountability is the more complex interaction that includes pressure on the government (central, regional or local) to either provide WASH services or regulate private sector provision. Figure 1: Long and Short Route Accountability- 2004 World Bank WDR. The realities of service provision are, of course, not as black and white as this simple model suggests. There are many WASH management models that have some permutation. While I acknowledge that the complex interactions implicit in any specific management model are critical, stripping down the analysis to the bare-bones basics is useful for messaging and conceptualizing the challenges. The take-home message is effectively one based in human geography. Individuals and households have certain levels of economic wherewithal and ability to exert political pressure on their government to provide WASH services, and these abilities (or inabilities) determine how and to what extent they are able (or unable) to access water. All too many times, those who lack access to water are those who are disenfranchised economically or politically. Rather than constantly react to the myriad instances of failure, the WASH sector should proactively build on sustainability efforts through better analyses of country, regional and local enabling environment issues and through individual project design. Fortunately, many of these systems of sustainability analysis exist. The problem is a lack of uniform agreement on how to implement them. At the country level, these decision tools are numerous. My favorite is the set of FIETS criteria. Additionally, UNICEF has created an excellent Bottleneck Analysis Tool (BAT) to address enabling environment challenges in the WASH sector. At the level of the individual project, I believe that every single water project should have to pass some sort of sustainability test— giving donors, NGOs and governments a better sense of whether those new sources of water will even be there in five or ten years. USAID’s Sustainability Index Tool (SIT) is one potentially useful tool in this regard. While improving the financial means of households and accountability of governments are two of the biggest imaginable challenges, these two concerns are critical to sustained increases in access to water. Acknowledging the more complex and country-specific service delivery frameworks and employing country-level and project-specific analytical tools are the only ways out of patterns of repeated failure. What Does This Mean For Urban Populations? At minimum, it is essential to emphasize the importance of the governance and economics of access to water. Even more so, as David Satterthwaite rightfully asserts, access to clean and regular water, along with high rates of urbanization, increases disease and other environmental risks. The informal and unplanned settlements in the largest developing country megacities house a complex set of economic and governance factors. These areas are home to some of the most disenfranchised vulnerable populations. Water projects need to understand and account for this context. In another blog post, Ed Bourque describes some of the most intractable barriers and constraints to increased access. It must be noted that markets for water do not always function fairly or perfectly, and in this blog post, he points to a classic case of “water mafias” who sabotaged and rendered a water supply project pointless. To read more about Ed Bourque’s work, click here.